The Red Slender Loris is one of two slender loris species, the other one being the grey slender loris. They have a body length between 11.6 and 17 cms (4.6 - 6.7 inches), they do not have a tail and they weigh between 103 and 172 g (2.6 - 6.1 oz). They have soft, dense fur and it is reddish/brown in colour with a silver/grey coloured underside. Their limbs are long and slender and on each foot their big toe opposes the other 4 so they have a pincer-like grip. They have large, round, forward facing eyes which enable them to have a precise depth perception. Their ears are large, round, thin and hairless at the edges. On their face they have a central pale stripe that starts above their eyes and runs down towards their nose. The Red Slender Loris can be found in the lowland rainforests, tropical rainforests and inter-monsoon forests in the south western wet-zone of Sri Lanka. They form small social groups consisting of individuals of both sexes and some youngsters. They are nocturnal and during the day they rest in a tree hole, a dense leaf nest or a similar secure place. 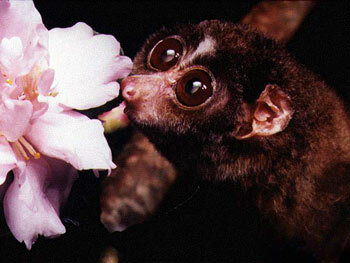 The Red Slender Loris feed upon insects, lizards, small vertebrates, leaves, buds, fruit and birds eggs. The Red Slender Loris breeds twice per year between May and December. After a gestation period of 166 - 169 days, 1 or 2 young are born. They are weaned by the time they reach 7 months old and become sexually mature at 10 months old. Humans are the main predator of the Red Slender Loris. The Red Slender Loris has been included as one of the 10 species to be investigated by the Zoological Society of London Edge of Existence Programme in 2007.